Friendship Tails: Wine, dogs and BVNS - 3 of my favorite things! Wine, dogs and BVNS - 3 of my favorite things! 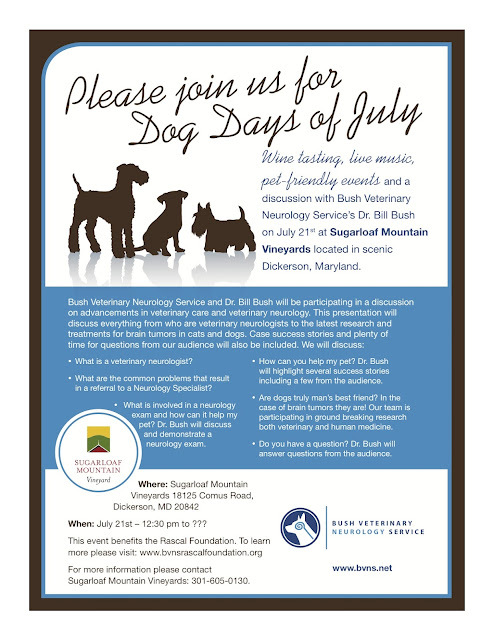 If you are looking for something fun to do this weekend with your dog check out the fun event Dr. Bush and his crew at BVNS are hosting to raise money for the Rascal Foundation. I hear that Puck the Corgi will be in attendance so you can meet him and enjoy some local wine with your two and four-legged pals. Frank and I would have loved to attend but I have a book appointment schedule at Friendship on Saturday so we have to miss out. Enjoy!